Theodora - Augusta of Imperium Romanum from 270 to ? Flavia Maximiana Theodora was a Roman Empress, and the second wife of Constantius Chlorus. The couple married in 293 AD, after Constantius set aside his first wife, Helena, who was the mother of future emperor Constantine the Great. 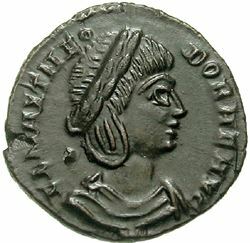 Although the marriage was political in nature, Theodora and Constantius had six children together; Flavius Dalmatius, Julius Constantius, Hannibalianus, Anastasius, Flavia Julia Constantia, and Eutropia.